The late heavy snow and persistent rains this spring have saturated Wisconsin soils. Therefore, what producers do in their fields in the next few weeks with respect to traffic management will have a significant effect on the yield potential of their crops. Timely operations are necessary to apply fertilizer and other amendments; conduct appropriate tillage; and then plant to meet the goal of successfully growing a crop. As operations have grown larger, time management becomes an issue and the temptation to be in the field as soon as possible is great. This can increase the risk soil compaction, especially when the axle load of equipment exceeds 10 tons. The ability to compact a soil increases as the soil water content increases. Highway engineers, for whom compaction is a good thing when constructing roadbeds, utilize the Proctor Test to determine the water content at which the maximum soil bulk density can be obtained. This water content is typically near 80% of saturation, which is roughly equivalent to the “field capacity water content” of the soil or that level found after excess water is drained by gravity. Soils are at or near field capacity this spring making them very susceptible to compaction. It has been said that you get one chance to make a first impression, and relative to compaction most of the “impression” occurs in the first pass over the soil. Figure 1 shows the penetrometer resistance measured after multiple passes with a 14 ton combine on a silt loam soil at the Arlington Agricultural Research Station. The surface soil was near field capacity water content. These data show distinctly greater penetration resistance down to a depth of 10 inches. The effect with one pass at any depth was 50 – 70% of that measured with six passes. Such compaction destroys aggregates, reduces porosity, and increases the resistance to root growth in the soil; all factors that contribute reduced yield. Figure 1. 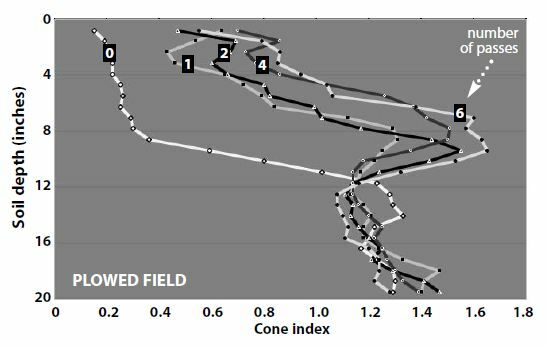 Effect of multiple passes with a 14 ton combine on the penetration resistance of a silt loam soil (Source: UWEX Pub. A3367). Delay operations when soils are wet. Often a sunny, breezy day can substantially dry a soil, increase its bearing strength, and reduce the compaction potential. Limit load weight. Use lighter equipment whenever possible. Tandem axles are better than duals. Adding extra tires may not compensate for increased load and will spread compaction over a greater soil volume. Control traffic. Attempt to drive in the same track and avoid taking shortcuts or unnecessary trips over a field. Subsoil only when compaction has been diagnosed. Leave untreated check strips to evaluate response.